The Jordanian government began blocking over 200 websites on Sunday for failing to obtain licenses under a strict set of new guidelines, Ruth Michaelson reports. Four amendments to the country’s press and publications law gave the government the power to censor sites that fail to comply, close outlet offices and hold the site owners responsible for posted comments. The changes to the law, which were introduced in 2012, sparked a backlash that saw 1,000 Jordanian sites stage a blackout on 29 Aug 2012. Undeterred, the government implemented the changes. According to press reports, 281 sites have so far been targeted. The pro-government Jordan Times quoted Fayez Shawabkeh of the Press and Publications Department (PPD) as saying that his department was responsible for compiling the list of “unlicensed” sites, which was forwarded to the Telecommunications Regulatory Commission (TRC). In turn, the TRC pressured the country’s service providers to begin implementing the blocks. 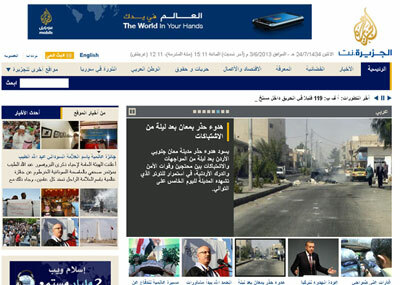 Al Jazeera is among the sites being blocked in Jordan for failure to obtain a license. The amended press and publications law requires websites to obtain licenses similar to the rules that require printers to register, without regard to the differences between the mediums. Therefore, the amendment is not simply regulating Jordanian sites, but any site available to view in Jordan- essentially requiring the entire Internet to comply with what appears to be a rather opaque and poorly defined category of regulations. In order to stay within the law, any site that wishes to be viewed in Jordan has to obtain a license and police the content of the site, irrespective of where it is in the world. The Jordanian government has “stressed that the law is aimed to organize the sector and provide legal guarantees against slander and unlawful material” according to AmmonNews. Given the flexible and rather expansive language of law, there also appears to be few guarantees or safeguards that the government won’t block a site arbitrarily or simply amend the law to block sites that it wishes to target. The stated framework of this law also raises questions as to whether sites like Al Jazeera, Penthouse, Time Out or the Muslim Brotherhood would ever be able to obtain licenses to be viewed in Jordan. Last year, the country’s parliament considered a law that would have banned the Muslim Brotherhood from participating in the then upcoming election, on the basis of banning “religious parties” and Al Jazeera has sometimes been regarded as the fuel of anti-government protests across the Middle East. Penthouse would undoubtedly fall foul of public decency laws. It is unclear precisely what threat Time Out poses. It is also unclear at present whether the Jordanian authorities will continue to ignore to the intense pressure from press freedom and civil society groups such as the Jordanian Centre for Defending the Freedom of Journalists, who described the law as “storm[ing] the freedom of electronic media”. Yet on the same day that the new law went into affect, King Abdullah launched his “Democratic Empowerment Programme”, dubbed Demoqrati, which according to The Jordan Times “is founded on development-boosting values such as the rule of the law, rejection of violence, acceptance of others, dialogue and accountability. It is also meant to stimulate civil society institutions to play their role as a key supporter of citizens and issues of concern to the public.” It appears that the Kingdom is yet to regulate irony. Ruth Michaelson is a correspondent for Radio France International and freelance journalist based in the Middle East. Her work has appeared in a variety of outlets from Le Monde Diplomatique to Vice. She is currently based in Cairo as part of the Global Post GroundTruth Project.